I'm a watch girl. I wear one almost every day. I just don't feel "dressed" without a watch. It's an accessory necessity for me. So when Jord asked me to style one of their watches, of course I said yes! The website photos looked great, but honestly I was blown away how stunning their watches are in person! I am wearing the Reece Series--Zebrawood and Emerald watch. Want a Jord watch of your own? They're running a special give-away for The Midlife Fashionista followers. Just enter here, it's easy! Now this my friends, is no ordinary watch---it's handcrafted from wood and is truly a work of art. There are several things I love about this watch in addition to the way it looks (gorgeous). It's super lightweight, which makes it super comfy. It's easy to get on and off (some watches are a big pain!). It's UNIQUE plus it's packaged so beautifully (great gift). And last but not least, the company has a huge heart. They gave me an extra watch as a way to raise money for Uncommon Threads, the nonprofit I recently launched. 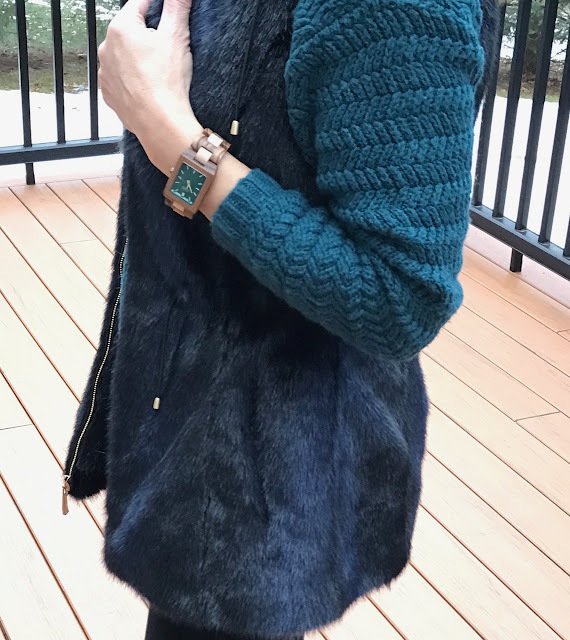 I could go on and on about how great this Jord watch is but I also want to tell you about the rest of the outfit...especially these Patricia Green boots! 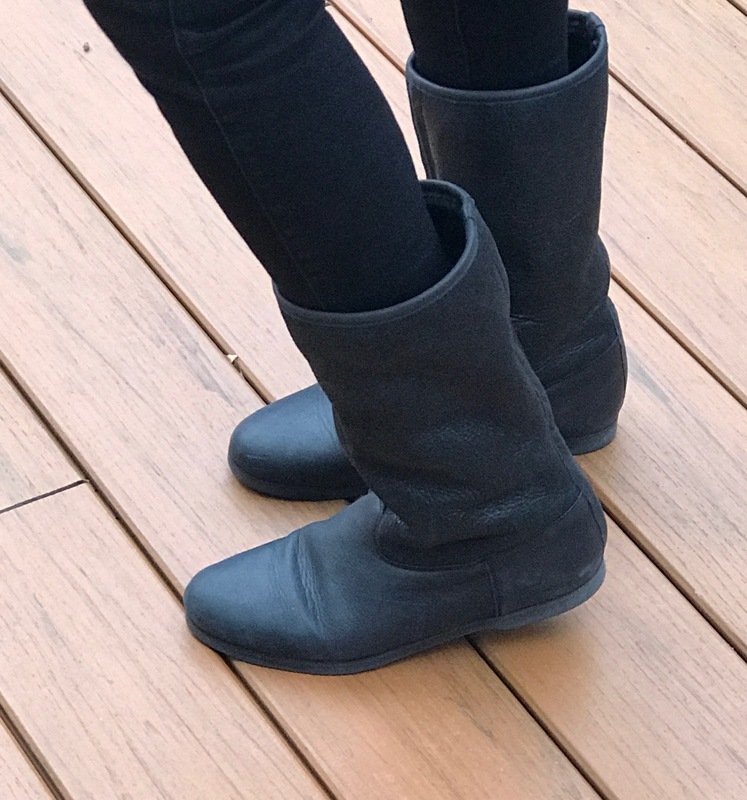 Patricia Green sent me these Maine boots several weeks ago and they're so comfy and toasty that I've been wearing them all the time. The leather is buttery soft and the boots are surprisingly lightweight! They're like wearing sneakers! 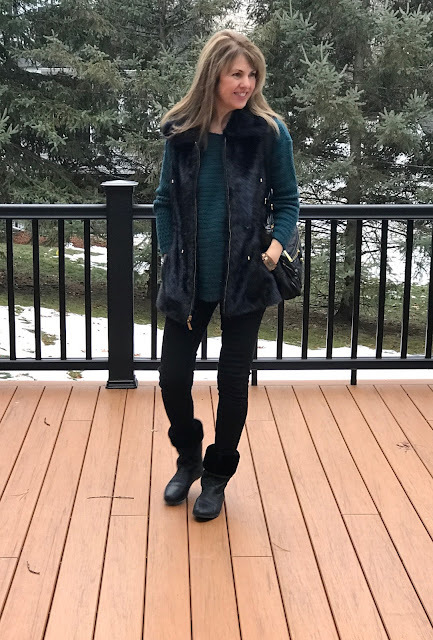 The shearling cuff can go up or down, giving the boots two slightly different looks. I like them both ways. Right now they're on sale at over $100 off (great deal!) and they also come in gray. Find them HERE. For this cozy outfit, I pulled out my heavy black faux fur vest (similar here and here), teal sweater (similar here and $11.90!) and super comfy high waisted black skinny jeans. I hope you are enjoying the holiday season. It's hard to believe that 2017 is just a few days away...how did THAT happen? Hair by the fabulous Robert Jason Salon. Some links in this blog may generate a small commission and the Jord watch and Patricia Green boots were gifted. However, the content of my posts are based on my own honest opinions and are not in any way influenced by partnerships. You're looking amazing in your JORD! 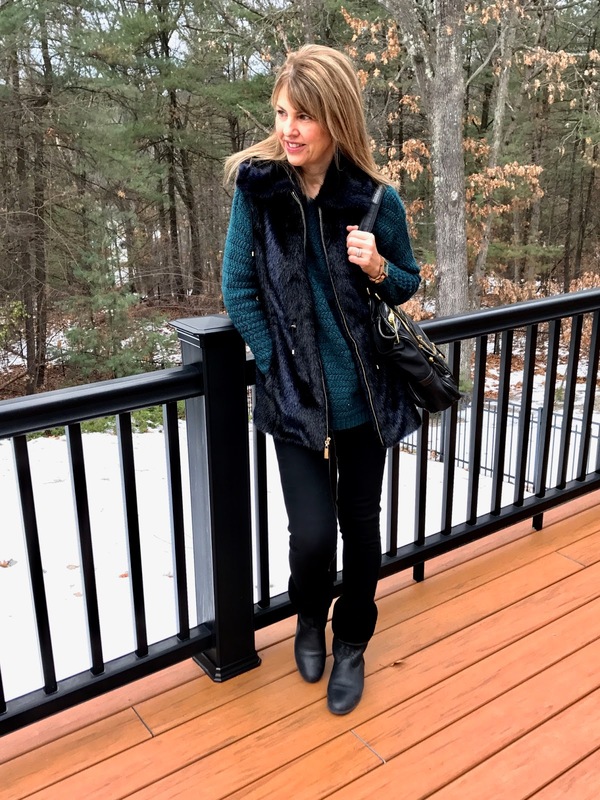 Thanks so much for sharing with Fun Fashion Friday and wishing you the best in 2017, you special lady!